That young people are moving to cities is well established by now, but in some cities, it’s more true than others. One question that lingers is whether some American cities will be left behind. In the 1970s, net migration of 20-24 year-olds in the City of St. Louis was -24.1/100. Those who stayed kept the city from turning out the lights. The revitalization of Soulard and Lafayette Square got started that decade. We may owe the existence of those neighborhoods to those individuals. Yet many more neighborhoods fell. Young people were fleeing the city. 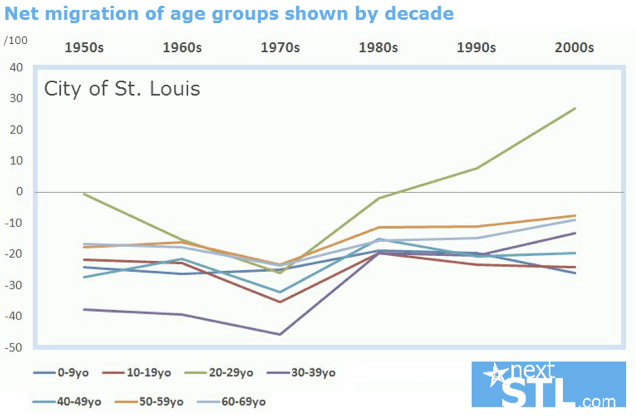 In fact, every age group was fleeing St. Louis in the 1970s. The city lost a net 169,435 residents that decade, 27.2% of its population. So yes, thank you for painting that Victorian on Mississippi, but your generation hated the city. Oh, and every age group saw a negative net migration in the 1960s and the 1980s too. The city was dying. Cities don’t die when some people leave, some groups have always left, but when everyone’s leaving, cities die. Then in the 1990s, people aged 20-29 produced the first positive net migration for any group since the 1950s. These are the GenXers. And oh my God, just wait until some blinkered editorial key pecker is told that GenX deserves credit for resuscitating St. Louis and other American cities. Net migration for 25-29 year-olds has rocketed from -28.1/100 in the 1970s, to 11.8/100 in the 1990s, to 35/100 in the 2000s. This is an unprecedented demographic shift in our city. The coffeehouses and dog parks are the superficial markers someone unwilling or unable to use empirical data, or unaware of larger cultural shifts, uses to apply a veneer of sameness over the real change. Some conclude that this new generation of self-aggrandizing, self-appointed city-savers haven’t earned anything, that their pompous self-importance is nothing new. This is false. No single generation “saves” a city, but Millennials are having a greater positive impact on the population of the City of St. Louis than any generation in several generations. And yet it’s apparently more comfortable to offer a rhetorical ear flip to a new generation than recognize how the world is changing around you. Elsewhere on the Network today: Urban Milwaukee says that the city’s bus system is in pathetic shape; with reduced state funding, it’s struggling to turn over the reins to a private operating company. Streets.mn looks at efforts to retrofit a suburban area of St. Paul. And Voice of San Diego offers an interesting theory on why urban density gets a bad rap. Is Generational Turnover Necessary for the Return of Cities? Will Young Republicans Change the Narrative About Conservatives and Cities?